Tandem flights are a great introduction into the sport, or just something exciting to do (similar to skydiving or bungee jumping, only the rush lasts for the entire flight — and you can be in control). Tandems are also useful for beginner and intermediate pilots to brush up on skills, maneuvers, or thermalling technique. 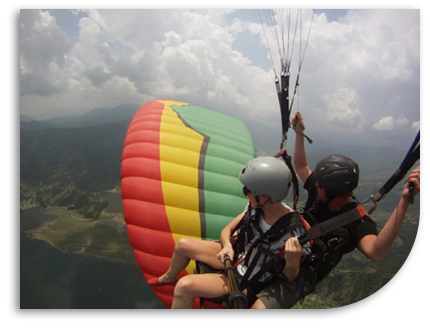 Tandem flights are the sweet result of a simple recipe: a wing large enough to hold two people, an instructor and a passenger. Each person is seated comfortably in their own harness which are attached together, with the passenger in front and the pilot behind. Once this configuration is soaring, the pilot can easily talk to the passenger and explain how to control the paraglider. If the conditions are right and the passenger is willing, the pilot may turn the controls over to the passenger and let them experience what it is like to fly a freeflight craft. Bring your camera, because this is an experience you won’t ever forget! Tandem flights usually last around 20-30 minutes. We offer tandem flights 7 days a week year round both in the mornings and evenings. We fly 7 days a week if the weather allows. Step one is to call or stop by Adventure Toy Store Monday–Saturday 10-4. The shop number is 801-576-6460 to schedule your flight. Most mornings we have about 6 tandem spaces available and weekends often fill up quickly. We will generally need about a week’s notice to get you on the schedule, but we will work with you on shorter notice. We will NOT meet for your appointment at the shop, but you’re welcome to stop by if you want to check out the shop, book your reservation in person, buy a t-shirt, shop for kites, or meet the crew. When you make your reservation, please have any coupon or gift certificate information with you. We will ask for the date you would like to fly, how much you weigh, a phone number and email address to send confirmation. Please have all this information ready for each person who will be flying. We will then ask you to call during shop hours the day prior(or for evening flights, the day of) to confirm your reservation and get an exact meeting time, as it will depend on what the weather is doing and the time of year. The shop is closed Sundays, so for Monday morning reservations, please check in on Saturday. Please call and confirm your tandem flight with us. Shop Hours are 10-4 Monday-Saturday. If you do not confirm your flight, we will have no choice but to consider you canceled. Morning Flights: The time-frame we will fly you will vary depending on the time of year and weather, but they generally occur between 7-9am. Morning flights must be confirmed the day before, as we meet before the shop opens. The later in the day you call, the better idea we have of what the weather is looking like. If for some reason you cannot call, or if the shop is closed, send us an email. If we are unable to get a hold of you by 4pm we will have no choice but to consider you canceled. If the weather is iffy we will let you know and can reschedule you or wait until the morning to cancel. If you decide to give it a go and wait until the morning , we will generally text you an hour before your reservation time. If you need special arrangements(i.e. traveling more than an hour or can’t receive texts) let us know and we will work with you. Although we will do our best, we can’t predict the weather exactly and may sometimes have to do a last minute cancellation on site. We apologize for any inconvenience, but your safety is our highest concern and we would rather reschedule you as many times as possible to make sure you will be safe and have fun. Occasionally we will cancel and there will be other people flying. Each pilot makes his or her own decision to fly; we are making the decision with you and will be more conservative. If you have any questions on weather just ask, we will be happy to let you know what went into our decision making process. Evening Flights: The time-frame we will fly you will vary depending on the time of year and weather, but they generally occur between 4-7pm. Evening flights must be confirmed the day of, as the evening weather is very particular and we need to be able to see what the winds and skies are currently doing. The later in the day you call, the better idea we will have of what the weather is looking like. If for some reason you cannot call, or if the shop is closed, send us an email. If we are unable to get a hold of you by 4pm we will have no choice but to consider you canceled. If the weather is iffy we will let you know and can reschedule you or wait until you get out there to cancel. If you decide to give it a go and wait, we will generally text you an hour before your reservation time. If you need special arrangements(i.e. traveling more than an hour or can’t receive texts) let us know and we will work with you. Although we will do our best, we can’t predict the weather exactly and may sometimes have to do a last minute cancellation on site. We apologize for any inconvenience, but your safety is our highest concern and we would rather reschedule you as many times as possible to make sure you will be safe and have fun. Occasionally we will cancel and there will be other people flying. Each pilot makes his or her own decision to fly; we are making the decision with you and will be more conservative. If you have any questions on weather just ask, we will be happy to let you know what went into our decision making process. Morning Flights: Morning flights take place at the SOUTH SIDE flight park. On your scheduled date and time you can always arrive early to watch others fly. The Point is a beautiful spot to watch the sunrise, but bring an extra layer, it can be chilly in the early morning wind. Please follow directions to the TOP of the South Side. Once you arrive at the flight park, look for the Cloud 9 Team. Generally you will know the name of your tandem pilot, or you can meet them at the White Toyota Tundra with Cloud 9 stickers all over it. Should you be unable to find your pilot, ask anyone for Cloud 9 and they will easily be able to direct you. Once you arrive we will fill out a waiver, get you set up with your pilot and it you in your harness. Occasionally your pilot will still be in the sky with their previous passenger; we appreciate your understanding and patience. Your tandem pilot will guide you through the process step by step; please listen carefully to everything they say. If conditions are such that we are not able to say up and soar around the Point for a bit, we will let you know beforehand and sometimes urge you to reschedule. Longer flights are more fun and we want you go get the most out of your experience. If you want to still go on a light day, we will land at the bottom of the flight park and get a ride back up top and conditions are usually fine to do another flight, often letting you take the controls for a turn or two, or we can do some more radical sharp turns to get your heart beating. Once you land we will take your helmet and harness back and you are good to go. You are welcome to tip your pilot if you had a great time! Evening Flights: Evening flights take place at the NORTH SIDE flight park. Please be sure you have directions and drive slowly through the neighborhood, it’s tempting to look up and be watching us fly, but there are a lot of kids and pets who are our flight park neighbors. You are welcome to arrive early and watch others fly. Once at the flight park, if you can’t find your pilot, ask around for Cloud 9 and anyone will be happy to direct you. Please feel free to walk around, ask questions and take plenty of photos if you have to wait a few minutes. North Side nights used to happen like clockwork; but over the last 5 years for many theorized reasons, the wind patterns and afternoon weather has changed, often forcing us to postpone or reschedule due to non-flyable weather. If this happens, please bear with us or try a morning, they are much more reliable. We are willing to reschedule you as many times as necessary in order to get you flying at no extra charge to you. We have also lost access to the 4×4 road that accesses the top of the ridge, further limiting our ability to do longer tandem flights in the evening. Once you arrive we will fill out a waiver, get you set up with your pilot and it you in your harness. Occasionally your pilot will still be in the sky with their previous passenger; we appreciate your understanding and patience. Your tandem pilot will guide you through the process step by step; please listen carefully to everything they say. Once you land we will take your helmet and harness back and you are good to go. You are welcome to tip your pilot if you had a great time! For any Tandem flight, dress for the weather. It’s often chilly in the mornings as we are in the wind the entire time. We suggest wearing layers, so if it warms up, you can be comfortable. Drinks, snacks, cameras, friends, cheerleaders, folding chairs, picnic blankets or even a bucket of chicken are fun to have at the Point. Both the North and South Side are parks. We encourage kids, pets on leashes, a frisbee, anything you’d like so long as you are mindful of pilots launching and landing. There are restrooms on top of both the North side and South side parks. Please wear closed toed shoes. You are not required to wear long sleeves or long pants but they may be helpful if you trip and fall on launch. Make sure you have your voucher or gift certificate with you and print off directions. Each year many people end up at our shop or at the wrong flight park. (Remember Mornings on South Side, Evenings on North Side.) If you show up and no one is there at the park, you may be at the wrong side. Please make sure you know where you are going! All morning flights meet on top of the South Side of the Point. Evening Tandem Flights are on the North Side and the Shop is in Draper, but only open between flying sessions, usually 10-4 Monday-Saturday. You can find directions here.